It’s becoming increasingly important for all of the big car manufacturers to offer electric drive, but there are still a couple of big decisions for them to make, and one of the most important is whether to develop a brand new bespoke electric model or to use an existing platform. For VW the decision is clear, with a successful range of petrol and diesel models, why develop something new? The Mk 7 Golf may not be a bespoke electric model but it was designed from the outset to take an electric drivetrain. This has allowed the batteries to be integrated into the floor under the front and rear seats and utilising the central tunnel that would normally carry the exhaust. Despite this you do still lose a little boot space with 341 litres available instead of the normal 380 litres. The lack of a dedicated electric model may lead you to think that VW isn’t taking this very seriously, however as well as designing the Golf to be electric it has also taken the design and manufacture of both the electric motor, and more surprisingly the batteries, in house. This commitment to developing the core elements shows that Volkswagen intends to stay in this market. One of the best features of the e-Golf is the ability to choose the level of regenerative braking using what would have been a gear lever. D provides no regen, allowing coasting, D1 provides a little, while 2, 3 and B provide increasing levels, which are sufficient to activate the brake lights. This is great, as whilst lots of regen extends the range, it can make it difficult to make smooth progress, so giving the driver the option is a welcome addition. 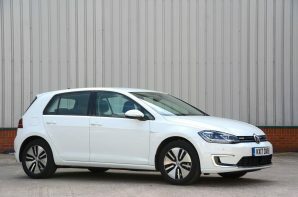 The e-Golf is a good choice if you want to go electric whilst keeping the driving experience as ‘normal’ as possible. It has a reassuringly long battery warranty, sensible range, and can be specified to allow rapid charging. In terms of price, it’s bang in the middle of the Golf range and offers potentially big savings in running costs. Recharge time: 240v charge 17 hours, 3.6 kW charge 10 hours, 7.2 kWh charge 6 hours 20 mins, DC CCS 40 kW rapid charge 45 minutes from 0 – 80%.